When your Ford truck, van, car, or SUV needs routine maintenance needs or repairs, our Service Center technicians at Lithia Ford of Klamath Falls have the tools, parts and accessories to keep your Ford high-performing and reliable. From oil changes and coolant flushes to tire rotations and larger auto repairs, our Service Center keeps your new or used vehicle running at top-condition for many more miles to come. Simply schedule your next service appointment with us online when your Ford needs expert maintenance when it fits your schedule. Our Service Center is open Monday through Saturday so your vehicle can receive the maintenance and service it needs after work or during the weekend. Set up an appointment time that works for you with our online Service Appointment Request portal. New and returning drivers can easily submit their contact and vehicle information to select the day and time that works for your schedule. Our service center staff will reply as soon as possible to confirm your appointment time. Investing in the quality of your Ford vehicle is cost-effective at Lithia Ford of Klamath Falls. Whether your vehicle needs an inspection, oil change, or transmission service, it's likely that we have a coupon or rebate for the services, accessories, or parts you're looking for. Contact us today at (877) 509-6796 to learn how you can save on your next service appointment. Expert service at a cost-effective price is just a drive away for California and Oregon drivers near Dorris, Tulelake, Ashland, and Klamath County. Contact or visit our Klamath Falls dealership to speak with our expert service technicians about your particular maintenance need. Lithia Ford of Klamath Falls services new Ford and used Ford vehicles, and all other makes and models. It's easy to schedule an appointment online at Lithia Ford of Klamath Falls. We're convenient to Dorris CA and Tulelake. Just drop your car off and we'll usually deliver same day service for most auto repairs, truck service and car maintenance. Whether it's an oil change, brake repair, tire rotation or you just want a seasonal inspection, Klamath Falls Ford is right here for you. We can handle any car repair, from a transmission to exhaust, right here at Klamath Falls Ford. Take advantage of Lithia's Assured Service Contract or Lifetime Oil Program. Here's Lithia's New Tire Protection Pledge! Watch service videos online! We understand the importance of the investment you have made with your vehicle purchase. Our auto repair centers are here to help you to protect that investment. With regular factory-recommended maintenance, Lithia Motors Assured service departments can help you to keep your vehicle in like-new condition. And if you want more than the basics, consider Assured Service's Lifetime Oil Program and Extended Service Contract. 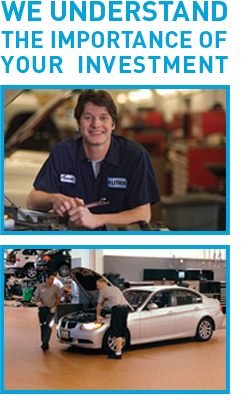 Our expert Klamath Falls Ford Service Team is fast, efficient, and friendly. They understand that you're in a hurry, and that auto maintenance only throws a wrench into your busy life. They work fast and hard to get the job done, and offer the care to ensure your car gets the best service possible. Our friendly service staff and state of the art high-tech service facilities set us apart from other shops. Make an online service appointment or call any of the Assured Service locations to schedule your maintenance or car repair. We look forward to serving you! Visit us today at 2833 Washburn Way Klamath Falls, OR 97603, or reach us by phone at 877-509-6796.